This is where you will find laminating pouches for your business cards, membership cards, and identity badge pouches. 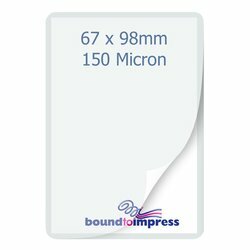 We also have slotted laminating pouches that are suitable for luggage tags and ID cards that you can attach with a luggage loop from our accessories area. Choose a size that gives you a 5mm overlap around your business cards for the best results. We can also customise laminating pouches to your requirements, for example cutting down to a specific size, or punching slots so that you can attach a lanyard or id clip. Which micron should I choose? A micron (or Mic) is the term used to measure the thickness of the lamination sheet. The higher the micron the thicker the sheet, and so the more rigid the finish when laminated. We sell pouches from 80 to 250 Mic. Choose the one that best suits your needs, all of our pouches are premium quality. Note: If you have a large order quantity or have special laminating requirements please use our Contact Form and we will provide you with a quote or assistance with your order.